Pokemon XD: Gale of Darkness Nintendo Gamecube Disc Only. I have played it so I know it works. Search in the dark to bring light to the shadows in "Pokémon XD: Gale of Darkness.". Destroy the darkened souls, release imprisoned spirits, and bring emotions back into play. You can purify the Pokémon, resist the force of the dark gale, and bring light back from darkness. Pokemon XD: Gale of Darkness (Nintendo GameCube, 2005). Condition is Very Good. Shipped with USPS First Class Package. Disc Only. No manual, artwork, or case included. Nintendo GameCube Console: Pokemon XD Gale of Darkness . Both the Composite cable and the AC adapter are included. No controller is included!Condition is Acceptable. Plays games nicely but since it is an older console the laser can be prone to going out. There are no guarantees that it will read every disc perfectly. It has usual wear and tear but is in overall good condition. Being sold as is. Returns will not be accepted. Please contact me with any questions you might have. Pokemon XD: Gale of Darkness (Nintendo GameCube, 2005). Condition is Good. Game has been tested & works. Comes with game, case & manuals. Please message me with any questions regarding this item. Thank you. Pokemon XD: Gale of Darkness (Nintendo GameCube, 2005). Condition is Good. Shipped with USPS First Class Package. Game disk and case only. Manual is missing. Adult Owned and Tested! Disc shows light normal blemishes from use. Disc and Insert are in GOOD condition. Pokemon XD: Gale of Darkness (Nintendo GameCube, 2005) Authentic Tested !! US shipping only and PayPal payments !! Disc has scratches and plays well !! 5 out of 5 stars - Pokemon XD: Gale of Darkness (Nintendo GameCube, 2005) Authentic Tested !! 172 product ratings172 product ratings - Pokemon XD: Gale of Darkness (Nintendo GameCube, 2005) Authentic Tested !! NEW SEALED Pokemon XD: Gale of Darkness (Nintendo GameCube, 2005). See pictures for details. Please message if you have any questions. 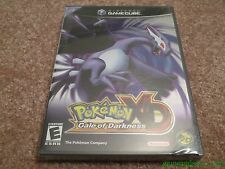 Nintendo GameCube Pokemon xd gale of darkness not for resale factory sealed!!! Pokemon XD: Gale of Darkness (Nintendo GameCube, 2005). Condition is Good. Shipped with USPS First Class Package. IT WILL ALSO WORK ON THE Wii SYSTEM. THERE ARE NO TEARS AND NO LOOSE DISC. THAT IS YOUR RESPONSIBILITY. THESE ARE ACTUAL PICTURES OF THE ITEM. IT'S THE ORIGINAL VERSION NTSC-U.S.
Pokemon xd gale of darkness factory sealed! If you have any questions please dont hesitate to ask. Pokemon XD: Gale of Darkness (Nintendo GameCube, 2005) Game Tested WORKS GREAT!! 5 out of 5 stars - Pokemon XD: Gale of Darkness (Nintendo GameCube, 2005) Game Tested WORKS GREAT!! 172 product ratings172 product ratings - Pokemon XD: Gale of Darkness (Nintendo GameCube, 2005) Game Tested WORKS GREAT!! It is in very good shape and includes the original case BUT NO manual. Pictures are of the Actual Item! Only signs of wear are 2 minor like dings if you look at it just right. Item is actually New/Unused and has been in storage since I bought it years ago and the wear it has was there when I bought it. Console works, Tested and Cleaned. HARD TO FIND CONSOLE . (It has been tested and works properly.). Version: FOR JAPAN ONLY (NTSC-J). I can put up many variety of Japanese goods for sale. Pokemon XD Gale Of Darkness has been cleaned, tested and is working. You play a young Pokémon Trainer in the Orre Region, two years after the events of Pokémon Colosseum. An evil organization has been kidnapping Pokémon and shutting the door to their hearts in order to turn them into Shadow Pokémon, built only to attack. Pokemon XD Gale of Darkness PAL Nintendo Gamecube B *VGWC*＋Warranty! Warranty type :RFG Warranty. Warranty Included. Warranty :Yes. Has y-folds and is in very good, near mint condition! See photos.